Netta from Israel has impressed the bookmakers and the fans since her song "Toy" was announced. The stage performance is a little shambolic. Netta plays behind her looper where colourful words like Hey and Toy appear illuminated. Her three dancers add nothing to the performance to be honest. However, the empowering dance song had the audience captivated and cheering. The bookmakers have not revised the odds downwards since the rehearsals and Netta remains the favourite to win. However, the feeling is that her winning is not so assured as it had been before rehearsals. This remains the bookmakers favourite based on reactions before the rehearsals. 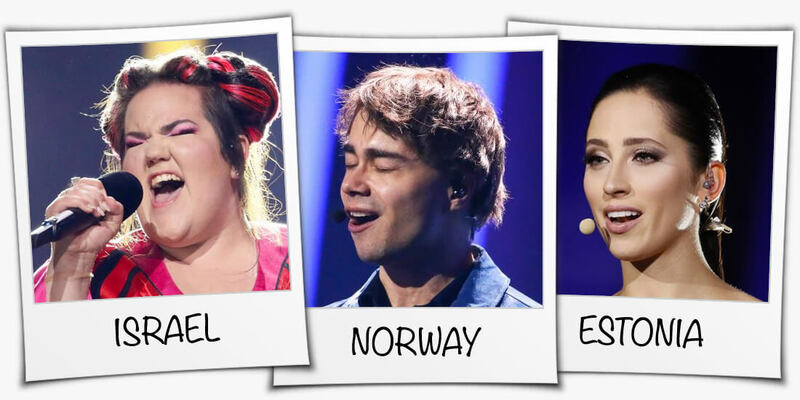 Alexander Rybak from Norway has also impressed the bookmakers with his rehearsals and his song "That's How You Write A Song". The stage performance is the same as in the Norwegian final. Animated instruments are displayed on the screen. His dancers work well together and Alexander's charm and history in the contest, has convinced the bookmakers to place him second in the odds. Equally the song has divided audiences and some think that Norway will fail to qualify this year. Elina Nechayeva from Estonia has impressed the bookmakers, the fans and the press with her rehearsals too. Elina's operatic voice and song "La Forza" has convinced the bookmakers that she is one to watch. Elina stands on a podium, with the biggest skirt that has ever been seen at Eurovision. As she sings her high notes, the dress lights up to helps tell her story and adds exciting visuals on the stage. This is why the bookmakers still believe that Estonia still has a good chance of winning. Operatic songs have not historically won Eurovision and it is hard to understand, why this would be considered third favourite. While the dress escalates the performance, this is a song contest, not a fashion show. DoReDos from Moldova have impressed the bookmakers, the fans and the press with their rehearsals. The stage performance is simple. There is a wall on the stage which has windows that open out to find the group and their dancers doing various things like posing and laughing from behind. The song "My Lucky Day" is extremely simple to either sing a long to or to dance to. The performance is especially colourful with the group dressed in the colours of the Moldovan flag. The lyrics are meaningless but adds to the jolly nature of the song. After DoReDos first rehearsal, the bookies brought them up in the table, from outsiders to eleventh based on the reaction from the press centre.